Who would play me in a movie? I'm not sure who would willingly play me in a movie but I know who I would absolutely love to play me in a movie. Now, before I say who it is... my choice does not in anyway mean that I live in some delusional world where I believe I bare any kind of resemblance to this woman except maybe both having brown hair. I've loved Julia Roberts since maybe fifth grade when I would watch her as a runaway bride over and over again in the small, VHS player attached, tv my parents had in their bedroom. I've loved anything she's ever done and I think she's just one of the most effortlessly beautiful women in the world. She seems like such a kind spirit with the most goofy laugh which is what I would like to be emulated about me if there was ever a movie made about me (god help movie go-ers everywhere). ^I have coveted this wedding dress ever since I saw it in Runaway Bride which has resulted in embarrassing amounts of research to see if' the designer is still designing. She is. ^I have wanted to recreate this look for Halloween for many years now but haven't gotten around to losing thirty pounds it. (speaking of weight.. my goal has always been a size 6 because she's a size 6 in Pretty Woman. Lofty ambitions, I know). ^Plus, who doesn't wan't Richard Gere as your love interest over and over again? Come on. ^One of my favorite movie lines, ever. I just love her! I'll be watching this eight times tonight now. 90s era Julia Roberts was fabulous...great choice! Aww that's adorable! Hope you and your man had fun! This is a great list of reasons for why she'd rock the part! And I chose her too! Have a great week! Aw, thanks, girl! & she's just the best, right?! 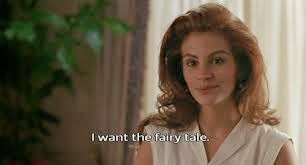 I ended up watching Pretty Woman last night and I could watch that over and over again. So good.